Somewhere in the cosmos, a star is reaching the end of its life. Maybe it’s a massive star, collapsing under its own gravity. Or maybe it’s a dense cinder of a star, greedily stealing matter from a companion star until it can’t handle its own mass. Whatever the reason, this star doesn’t fade quietly into the dark fabric of space and time. It goes kicking and screaming, exploding its stellar guts across the universe, leaving us with unparalleled brightness and a tsunami of particles and elements. It becomes a supernova. Here are ten facts about supernovae that will blow your mind. Two millennia later, in the 1960s, scientists found hints of this mysterious visitor in the remnants of a supernova approximately 8000 light-years away. The supernova, SN 185, is the oldest known supernova recorded by humankind. Combined X-ray image from Chandra and XMM-Newton of RCW 86. Low energy X-rays are in red, medium energies in green, and high energies in blue. RCW 86 is the probable remnant of SN 185. Everything from the oxygen you’re breathing to the calcium in your bones, the iron in your blood and the silicon in your computer was brewed up in the heart of a star. As a supernova explodes, it unleashes a hurricane of nuclear reactions. These nuclear reactions produce many of the building blocks of the world around us. 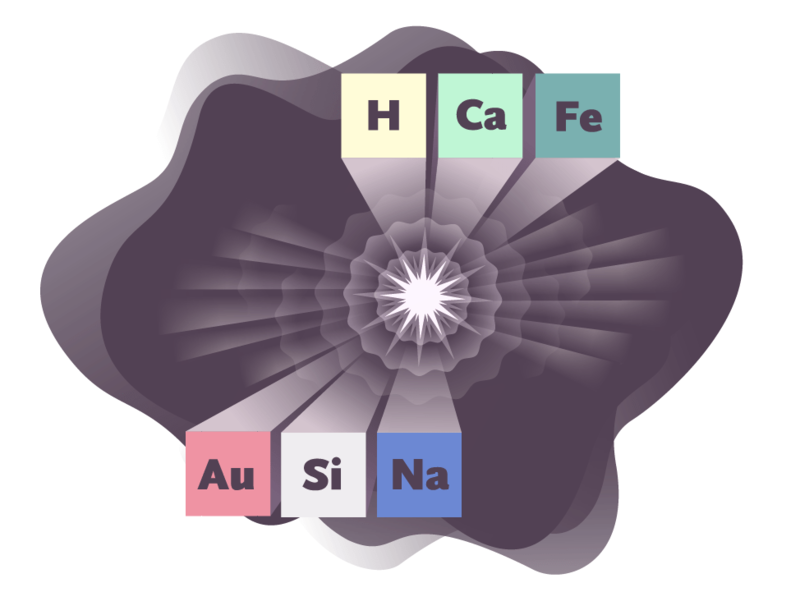 The lion’s share of elements between oxygen and iron comes from core-collapse supernovae, those massive stars that collapse under their own gravity. They share the responsibility of producing the universe’s iron with thermonuclear supernovae, white dwarves that steal mass from their binary companions. Scientists also believe supernovae are a key site for the production of most of the elements heavier than iron. Two men in a rubber raft inspect the wall of photodetectors of the partly filled Super-Kamiokande neutrino detector. In a 10-second period, a core-collapse supernova will release a burst of more than 1058 neutrinos, ghostly particles that can travel undisturbed through almost everything in the universe. Outside of the core of a supernova, it would take a light-year of lead to stop a neutrino. But when a star explodes, the center can become so dense that even neutrinos take a little while to escape. When they do escape, neutrinos carry away 99 percent of the energy of the supernova. Scientists watch for that burst of neutrinos using an early warning system called SNEWS. SNEWS is a network of neutrino detectors across the world. Each detector is programmed to send a datagram to a central computer whenever it sees a burst of neutrinos. 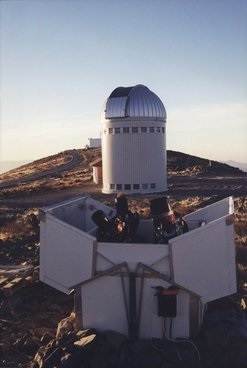 If more than two experiments observe a burst within 10 seconds, the computer issues an automatic alert to the astronomical community to look out for an exploding star. But you don’t have to be an expert astronomer to receive an alert. Anyone can sign up to be among the first to know that a star’s core has collapsed. Supernovae are natural space laboratories; they can accelerate particles to at least 1000 times the energy of particles in the Large Hadron Collider, the most powerful collider on Earth. The interaction between the blast of a supernova and the surrounding interstellar gas creates a magnetized region, called a shock. As particles move into the shock, they bounce around the magnetic field and get accelerated, much like a basketball being dribbled closer and closer to the ground. When they are released into space, some of these high-energy particles, called cosmic rays, eventually slam into our atmosphere, colliding with atoms and creating showers of secondary particles that rain down on our heads. In addition to forging elements and neutrinos, the nuclear reactions inside of supernovae also cook up radioactive isotopes. Some of this radioactivity emits light signals, such as gamma rays, that we can see in space. This radioactivity is part of what makes supernovae so bright. It also provides us with a way to determine if any supernovae have blown up near Earth. If a supernova occurred close enough to our planet, we’d be sprayed with some of these unstable nuclei. So when scientists come across layers of sediment with spikes of radioactive isotopes, they know to investigate whether what they’ve found was spit out by an exploding star. In 1998, physicists analyzed crusts from the bottom of the ocean and found layers with a surge of 60Fe, a rare radioactive isotope of iron that can be created in copious amounts inside supernovae. Using the rate at which 60Fe decays over time, they were able to calculate how long ago it landed on Earth. They determined that it was most likely dumped on our planet by a nearby supernova about 2.8 million years ago. If a supernova occurred close enough, it could be pretty bad news for our planet. Although we’re still not sure about all the ways being in the midst of an exploding star would affect us, we do know that supernovae emit truckloads of high-energy photons such as X-rays and gamma rays. The incoming radiation would strip our atmosphere of its ozone. All of the critters in our food chain from the bottom up would fry in the sun’s ultraviolet rays until there was nothing left on our planet but dirt and bones. Statistically speaking, a supernova in our own galaxy has been a long time coming. Supernovae occur in our galaxy at a rate of about one or two per century. Yet we haven’t seen a supernova in the Milky Way in around 400 years. The most recent nearby supernova was observed in 1987, and it wasn’t even in our galaxy. It was in a nearby satellite galaxy called the Large Magellanic Cloud [LMC]. But death by supernova probably isn’t something you have to worry about in your lifetime, or your children’s or grandchildren’s or great-great-great-grandchildren’s lifetime. IK Pegasi, the closest candidate we have for a supernova, is 150 light-years away—too far to do any real damage to Earth. Just as your voice echoes when its sound waves bounce off a surface and come back again, a supernova echoes in space when its light waves bounce off cosmic dust clouds and redirect themselves toward Earth. Because the echoed light takes a scenic route to our planet, this phenomenon opens a portal to the past, allowing scientists to look at and decode supernovae that occurred hundreds of years ago. A recent example of this is SN1572, or Tycho’s supernova, a supernova that occurred in 1572. This supernova shined brighter than Venus, was visible in daylight and took two years to dim from the sky. In 2008, astronomers found light waves originating from the cosmic demolition site of the original star. They determined that they were seeing light echoes from Tycho’s supernova. Although the light was 20 billion times fainter than what astronomer Tycho Brahe observed in 1572, scientists were able to analyze its spectrum and classify the supernova as a thermonuclear supernova. More than four centuries after its explosion, light from this historical supernova is still arriving at Earth. Because thermonuclear supernovae are so bright, and because their light brightens and dims in a predictable way, they can be used as lighthouses for cosmology. In 1998, scientists thought that cosmic expansion, initiated by the big bang, was likely slowing down over time. But supernova studies suggested that the expansion of the universe was actually speeding up. Scientists can measure the true brightness of supernovae by looking at the timescale over which they brighten and fade. By comparing how bright these supernovae appear with how bright they actually are, scientists are able to determine how far away they are. Scientists can also measure the increase in the wavelength of a supernova’s light as it moves farther and farther away from us. This is called the redshift. Comparing the redshift with the distances of supernovae allowed scientists to infer how the rate of expansion has changed over the history of the universe. Scientists believe that the culprit for this cosmic acceleration is something called dark energy. By the time you reach the end of this sentence, it is likely a star will have exploded somewhere in the universe. As scientists evolve better techniques to explore space, the number of supernovae they discover increases. Currently they find over a thousand supernovae per year. But when you look deep into the night sky at bright lights shining from billions of light-years away, you’re actually looking into the past. The supernovae that scientists are detecting stretch back to the very beginning of the universe. By adding up all of the supernovae they’ve observed, scientists can figure out the rate at which supernovae occur across the entire universe. Scientists estimate about 10 supernovae occur per second, exploding in space like popcorn in the microwave. Even though we’ve been aware of these exploding stars for millennia, there’s still so much we don’t know about them. There are two known types of supernovae, but there are many different varieties that scientists are still learning about. Supernovae could result from the merger of two white dwarfs. Alternatively, the rotation of a star could create a black hole that accretes material and launches a jet through the star. Or the density of a star’s core could be so high that it starts creating electron-positron pairs, causing a chain reaction in the star. Right now, scientists are mapping the night sky with the Dark Energy Survey, or DES. Scientists can discover new supernova explosions by looking for changes in the images they take over time. Another survey currently going on is the All-Sky Automated Survey for Supernovae, or the ASAS-SN, which recently observed the most luminous supernova ever discovered. In 2019, the Large Synoptic Survey Telescope, or LSST, will revolutionize our understanding of supernovae. LSST is designed to collect more light and peer deeper into space than ever before. It will move rapidly across the sky and take more images in larger chunks than previous surveys. This will increase the number of supernovae we see by hundreds of thousands per year. Studying these astral bombs will expand our knowledge of space and bring us even closer to understanding not just our origin, but the cosmic reach of the universe.